We augment a tree \(T\) with a shortcut \(pq\) to minimize the largest distance between any two points along the resulting augmented tree \(T+pq\). We study this problem in a continuous and geometric setting where \(T\) is a geometric tree in the Euclidean plane, a shortcut is a line segment connecting any two points along the edges of \(T\), and we consider all points on \(T+pq\) (i.e., vertices and points along edges) when determining the largest distance along \(T+pq\). The continuous diameter is the largest distance between any two points along edges. We establish that a single shortcut is sufficient to reduce the continuous diameter of a geometric tree \(T\) if and only if the intersection of all diametral paths of \(T\) is neither a line segment nor a point. 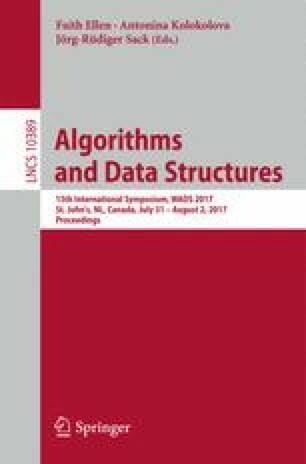 We determine an optimal shortcut for a geometric tree with \(n\) straight-line edges in \(O(n \log n)\) time. This work was partially supported by NSERC and FQRNT.